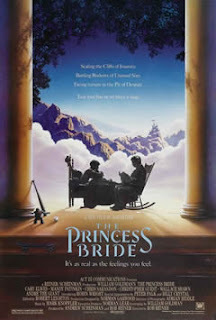 I bet I've seen The Princess Bride 200 times. Robert: It was a movie that, at first, I wasn't all that motivated to see. I ended up loving it so much that I bought the poster and hung it in my room next to the one for STAND BY ME! My name Inigo Montoya, now prepare to die! My boys and I have started to watch this together now (ages 9 + 7). The Andre the Giant mystique is lost on them a bit but we stll love it! Fred: How are you, sir? Good to hear from you. I watch this with my sons as well, and they also have a blast with it. And I think I've quoted that "prepare to die" line about 100x since I first saw it nearly 25 years ago! "I'll most likely kill you in the morning." Anytime I hear "As You Wish" I think of this one and "Inconceivable"